You are looking for a relaxing holiday in a farmhouse in Tuscany? With the possibility to taste the genuine local products? The farmhouses in Tuscany are well known for welcoming and comfortable atmosphere but to really appreciate the life of Tuscan countryside we definitively suggest you to try a dinner made with local products. -FATTORIA IL SALICE, 5 apartments in Foiano della Chiana, with pool, tennis court and play area for children. Then at your apartments you can taste the typical dishes prepared by Carla, the owner. Possibility to require a half board service. Extra-virgin olive oil available for sale. -AGRITURISMO SAN FRANCESCO, 4 apartments in Castiglion Fiorentino, with pool, volleyball field and a small restaurant, open only for the clients of the farmhouse, where taste the delicious dishes prepared for you by the owner. You can eat also at your apartment. -IL MULINO, 2 apartments at Palazzo del Pero, with pool and a small restaurant where you can taste the typical dishes prepared by Francesca, the owner. -PALAZZO CONTI, 8 apartments at San Quirico d’Orcia, with pool, a bio-lake with water depuration made through water plants oxygenation, and a small restaurant where you can taste the typical dishes prepared by the owner. 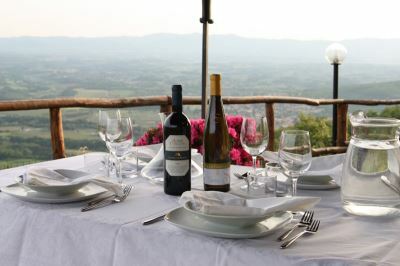 -AGRITURISMO SANT’AGATA, 6 apartments in the hills up to Cortona with pool. Then at your apartments you can taste the typical dishes prepared by Roberta, the owner. -AGRITURISMO LE BALZE, 3 apartments at Castelfranco di Sopra, with pool and a small restaurant where you can taste the typical dishes prepared by the owner. -AGRITURISMO CASAVECCHIA, 3 aapartments in the hills up to San Giustino Valdarno with pool. Then at your apartments you can taste the typical dishes prepared by the owner. -SAN ELISA E SAN FLORESTANO,10 apartments at Pomarance, near Volterra, with pool, tennis court and a restaurant, where you can taste the typical dishes. Possibility to require a half board service. -TORRE DI VIGNALE, 7 bedroom villa (14 persons) with private pool. Panoramic positions near Palazzo del Pero. On request Paola, the owner, will cook for you typical tuscan dishes. We wish you a very good holiday in a farmhouse in Tuscany!